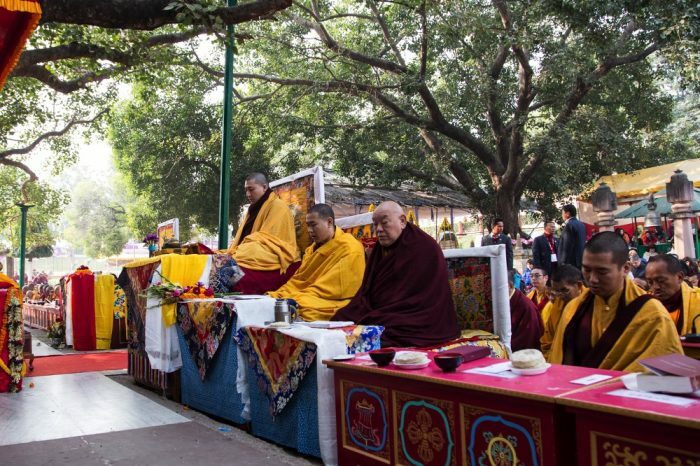 For the first time, students from around the world will be able to join Thaye Dorje, His Holiness the 17th Gyalwa Karmapa, as he leads Samantabhadra’s King of Aspiration Prayers under the Bodhi Tree in Bodh Gaya, at the Kagyu Monlam 2016. Please like Karmapa’s Facebook page to view the live stream. You can view the replay of the prayers from Thursday 15 December below. The practice of aspirations is one of the most important aspects of life as a Buddhist. We aspire to peace and prosperity for all sentient beings. Above all, we aspire for enlightenment for all sentient beings. From a Buddhist perspective, this is the ultimate aim in life. It is a state of the cessation of dukkha or confusion, and this is what we aspire to. For more details about the Kagyu Monlam, and to download a copy of the King of Aspiration Prayers, please visit the Kagyu Monlam page.